Salam’s Radio program on J-WAVE “Oriental Music Show” got the Best Radio Entertainment Award 2017 by The Japan Commercial Broadcasters Association! Salam regularly visits the Middle-Eastern countries and the Indian Subcontinent since 1980’s to make research local music, food & culture. He published 5 books about Music travelogues, reports & 3 books about the culinary from the region. Salam’s weekly music program “Ongaku Yuran Hiko” on NHK-FM is the most popular World Music radio program in Japan. And, his recipe book “MEYHANE TABLE” ranked as the No.1 in Amazon Ethnic cooking books category in 2016. 1990: Graduated the Department of Political Science at Meiji University. 6 years Worked at “WAVE Roppongi”, A legendary music store in Tokyo, then, started writing about music for several magazines. 1996: left Japan, and stayed in Montpellier, South France for 6 months to learn French. 2 years Backpacking travels around the Europe, Middle East, South East Asia, Tibet and India. 1998: Back to Tokyo, Worked for some Independent Music Labels and the public relations of the Tokyo’s biggest club “WOMB”. 2000: Became freelance Music Journalist. 2003: Published the 1st book “Trans World Express”. 2004: Started to talk in Radio Program on J-Wave. 2008: Started World Music Lecture Class at Wako University Open College. 2012: Started my own World Music Program called “Ongaku Yuran Hiko” on NHK FM. 2016: Published 2 books about the Middle Eastern Food, “MEYHANE TABLE” & “Breakfast in istanbul” . Started My 2nd Radio Program called “Oriental Music Show” on J-WAVE. 2017: “Oriental Music Show” on J-WAVE got the Best Radio Entertainment Award 2017 by The Japan Commercial Broadcasters Association! Published my 8th Book “Night in Joujouka, Morning with Sufi: Walking Through World Music”. “Breakfast in istanbul” The sequel of ”Oishii Chuto” 36 recipes from Turkey, Lebanon, Morocco, London, Tokyo & Israel, 2016. “Oishii Chuto (Delicous the Middle-Eastern Cooking)”, my 1st. cooking columns & 52 recipes from Turkey, Lebanon, Morocco, Egypt, Yemen & Israel, 2013. “21st Century Middle-Eastern Music Journal”, 2012. “Trans World Express Definitive Edition”, my travelogues with music and CD guide, 2008. “Planet India”. My quest of Indian music, including Hindusthani, Carnatic classical music, Rajasthani folk, Bollywood, and Asian Massives, 2006. “Trans World Express”, my travelogues with World music and CD guide, 2003. NHK-FM “Ongaku Yuran Hiko (Music Sight-Seeing Flying)”, regular World Music program on 4 times a month all over Japan! 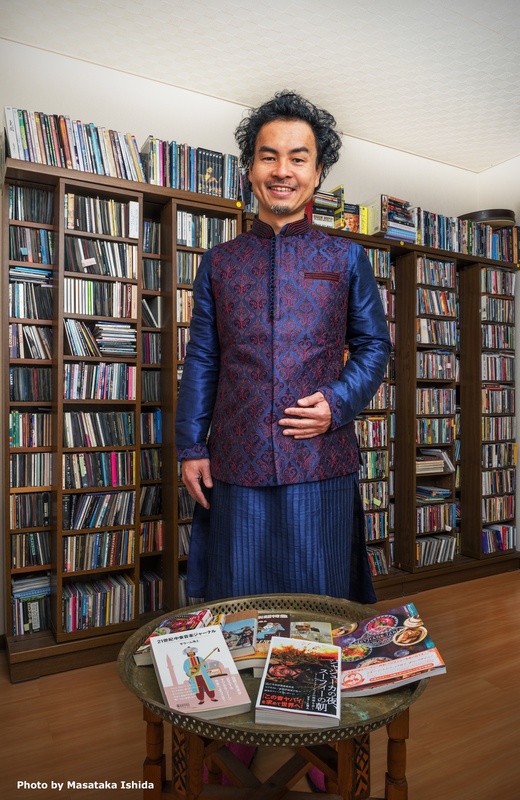 J-WAVE “Oriental Music Show” weekly World Music program in Tokyo & Eastern Japan Area. World Music studies at Asahi Culture Centre Shinjuku monthly. World Music studies at Dokkyo, Rikkyo & Wako University. DJ in nightclubs, and at wedding parties. supervising the Middle Eastern Cookings menus for restaurants.